Near the brightly colored Pena National Palace, lie the ruins of an ancient castle built by the Moors (North African Muslims) during Islamic rule of the Iberian Peninsula. It’s like anything one would imagine during the reign of King Arthur. It’s rampart battlements snake around an entire hilltop and provide an excellent view of the vast agricultural area it was intended to protect. Built during the 8th and 9th centuries, the site was a key stronghold for the various Muslim empires during their reigns. It was not until the 12th century that it was finally, and permanently, lost to the Christian rulers during the waves of Reconquista, or the “reconquering” of the Iberian Peninsula. Ending in 1492, the last Muslim forces were expelled by Christian kings around the year 1492 after a 700-year battle for regional supremacy. In their wake, not only did the Islamic kingdoms leave tremendous learning in the arts and sciences, but they also left innumerable fortifications throughout the peninsula which have been gradually converted and updated to include Christian symbolism and iconography. 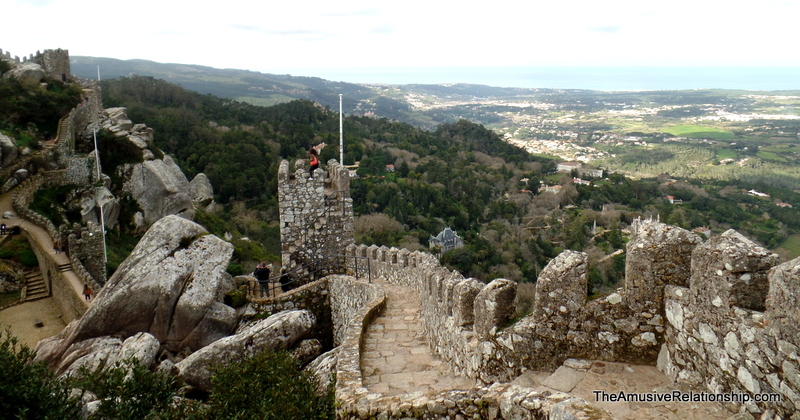 Within Castelo dos Mouros, there was built a chapel and Christian burial tombs. Truly, to walk along the castle walls felt like walking atop the world. One could see for tens of kilometers in every direction, including a defensive view of the Atlantic Coast. It’s no wonder this strategic spot was so important. Below are various images and caption of my visit.